Amazon affiliate links are used in this post. An ARC was provided for an honest review. From the book cover: One enchanted summer, two couples begin a friendship that will last more than twenty years and transform their lives. A chance meeting on the Isle of Palms, one of Charleston’s most stunning barrier islands, brings former sweethearts, Adam Stanley and Eve Landers together again. Their respective spouses, Eliza and Carl, fight sparks of jealousy flaring from their imagined rekindling of old flames. As Adam and Eve get caught up on their lives, their partners strike up a deep friendship—and flirt with an unexpected attraction—of their own. 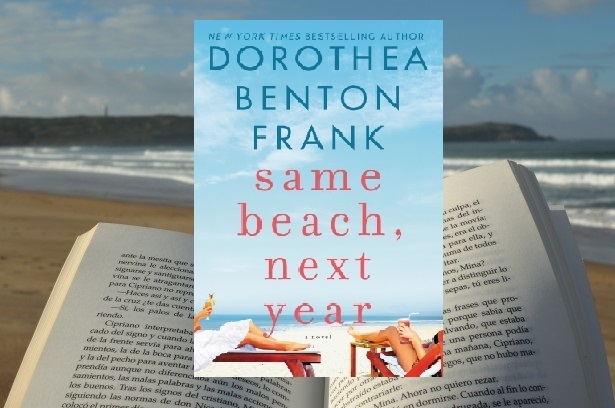 Year after year, Adam, Eliza, Eve, and Carl eagerly await their reunion at Wild Dunes, a condominium complex at the island’s tip end, where they grow closer with each passing day, building a friendship that will withstand financial catastrophe, family tragedy, and devastating heartbreak. The devotion and love they share will help them weather the vagaries of time and enrich their lives as circumstances change, their children grow up and leave home, and their twilight years approach. My Review: I am a real fan of Dot Frank and know that when her new book comes out every spring, it's time for summer and the beach! I have enjoyed all of her books but this is one of my favorites -- but I think that I say that every time I read one of her books. Eliza and Adam had been happily married for several years and were spending their vacation on the Isle of Palms with their toddler twin sons when Adam sees Eve - his first love from high school. Eve is at the same vacation complex with her husband Carl and their young daughter. They make plans for the two families to meet for drinks and even though they both tell their spouses that they were friends from high school, neither goes into detail about how deep their love for each other was. Sparks fly between Adam and Eve, even though they are both happily married, and it's apparent to Eliza and Carl that they were more than friends years ago. They manage to build a friendship between the four of them and they meet at the same complex at Isle of Palms every year until something happens years later to ruin the friendship and possibly the marriages. Will they be able to overcome the transgression that appeared to happen and become friends again? This is a lovely novel about love and friendship and keeping marriages happy as people head into their later years. I enjoyed all four of the characters but thought that Eliza was the most real and the best of the four. She grew more as a character and was able to learn to be herself and love who she was as a person and not just as a wife and mother. I also, as always, loved the setting. 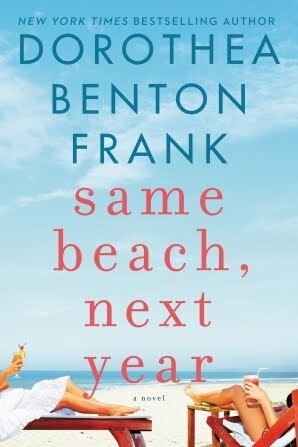 I love books about the SC Lowcountry - the beach and the sand and the feeling of being there with the characters always makes me enjoy a book even more. Dorothea Benton Frank was born and raised on Sullivan's Island, South Carolina. She is the New York Times bestselling author of the Lowcountry Tales Series which includes the books Sullivan's Island and Plantation. Her title's Porch Lights, The Last Original Wife, The Hurricane Sisters, All the Single Ladies, and All Summer Long made the New York Times bestseller lists in 2014, 2015 and 2016. Susan Roberts lives in North Carolina when she isn't traveling. She and her husband enjoy traveling, gardening and spending time with their family and friends. She reads almost anything (and the piles of books in her house prove that) but her favorite genres are Southern fiction, women's fiction and thrillers. Susan is a top 1% Goodreads Reviewer. You can connect with Susan on Facebook. I love the idea of vacationing with the same people year after year. I'm interested to see what happened to throw a wrench in these families' relationships!